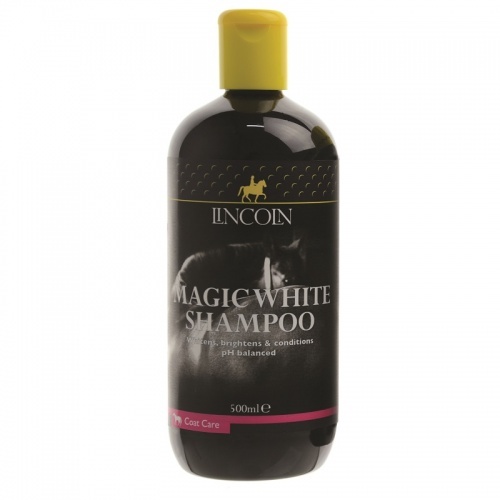 Lincoln Magic White Shampoo is scientifically formulated for whitening the coat of grey and white horses. Containing a combination of effective conditioning agents, this pH balanced horse shampoo will leave the coat smooth, bright and shining. Thoroughly wet the coat with water. Apply sufficient shampoo to produce a good lather and massage well into the coat. Rinse well with clean water, removing any surplus with a sweat scraper and dry thoroughly. For persistent yellow stains, use in conjunction with Lincoln Stain Remover. Avoid contact with eyes and keep out of reach of children. For animal use only.